Offering high performance and impressive specifications is the Acer Aspire 5602WLMi (£699 inc. VAT). 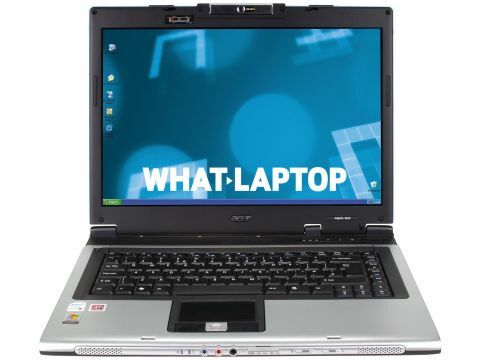 Like many similar laptops, the Acer is a dual-core model with power to spare, using a 1.66GHz Intel Core Duo T2300E processor and 1024MB of DDR2 memory. The 120GB hard drive provides ample storage space, but spins at a slow speed of 4200rpm. However, this has no negative effect on performance. MobileMark 2005 tests produced an impressive score of 238 points. With more than enough power for all computing tasks, there's little that this laptop won't be able to do with speed and ease. Less pleasing was the mobility of the system. With a weight of 2.8kg, the chassis is suitably mobile for short journeys. However, we recorded a battery life of just 156 minutes under day-to-day use, which falls below the three-hour minimum we expect. Placing it more as a home or office system, the low mobility is compensated by strong desktop features. While the 15.4-inch Super-TFT screen is a little too dim in bright conditions, images are sharp and detailed, and colour reproduction is just as impressive. Graphics are predictably mid-level, but the Acer's dedicated ATi Mobility Radeon X1300 chip betters the integrated graphics of many of its rivals. Scoring 3476 points from the 3D tests of 3DMark 2003, mild gaming will be possible when relaxing away from work. Located above the screen is a 1.3- megapixel camera. Moveable through 225 degrees, users can angle the lens for optimum focus - even spinning the camera to capture a first-person viewpoint. This is a nice touch for home instant messaging and business conferencing use. Equally useful is 802.11a/b/g Wi-Fi, allowing fast wireless connections in the UK or abroad. However, fixed networks aren't as fast as many rivals - only running at 10/100 Base-T speed, rather than faster Gigabit Ethernet cards. A prominent strength of the Acer is its usability. With a broad keyboard and comfortable typing action, long-term use is always a pleasure. A bank of hotkeys sit at the top right of the keyboard, and can be easily personalised via the included Acer Launch Manager software. With power and strong usability, the Acer Aspire 5602WLMi will easily suit the home or small business user with a need for speed.